This antibody has been tested in Western blotting against equal loadings of purified wild type survivin, 2B and DEx3. When used at 1/250, it detects a single clean (but weak) band of the appropriate size for DEx3, but no band is detected with wild type survivin or 2B. We have not succeeded in detecting endogenous Survivin DEx3 using this antibody (Survivin DEx3 is expressed at very low levels). This antibody has been used successfully however, to detect overexpressed Survivin DEx3 in whole cell extracts. Synthetic peptide of Human Survivin DEx3, derived from amino acids 50-150. This antibody should be aliquoted to reduce freeze-thaw cycles as it loses performance quickly after multiple freeze-thaws. Our Abpromise guarantee covers the use of ab3731 in the following tested applications. Survivin is expressed in G2/M phase in a cycle regulated manner. At the beginning of mitosis, survivin associates with mitotic spindle microtubules, this is essential for survivin's anti-apoptosis function. Survivin may counteract a default induction of apoptosis in G2 / M phase. Survivin over-expression in cancer may overcome this apoptotic checkpoint. Survivin DEx3 (lacking exon 3) and survivin-2B (retaining a part of intron 2 as a cryptic exon) are isoforms of survivin that behave differently to survivin. Skipping of exon 3 in survivin-Ex3 results in a modification of the BIR domain, followed by an additional frame shift in exon 4. In consequence, the open reading frame of Survivin DEx3 ends in the 3' untranslated region of survivin at position 581 and generates a novel 63 amino acids-long COOH-terminal tail in survivin-Ex3 coded by 87 nucleotides of exon 4 and 103 nucleotides of the original 3' untranslated region. See Mahotka et al. 1999 for more details. 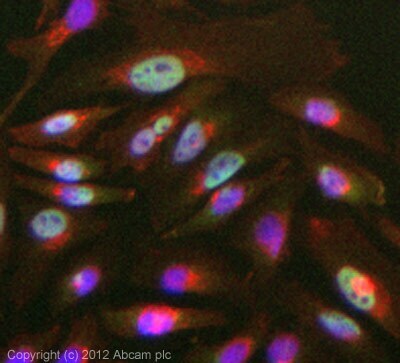 ICC/IF image of ab3731 stained HeLa cells. The cells were 4% formaldehyde fixed (10 min) and then incubated in 1%BSA / 10% normal goat serum / 0.3M glycine in 0.1% PBS-Tween for 1h to permeabilise the cells and block non-specific protein-protein interactions. The cells were then incubated with the antibody (ab3731, 5µg/ml) overnight at +4°C. The secondary antibody (green) was ab96899, DyLight® 488 goat anti-rabbit IgG (H+L) used at a 1/250 dilution for 1h. Alexa Fluor® 594 WGA was used to label plasma membranes (red) at a 1/200 dilution for 1h. DAPI was used to stain the cell nuclei (blue) at a concentration of 1.43µM. Publishing research using ab3731? Please let us know so that we can cite the reference in this datasheet. Gerne bestätige ich Ihnen, dass ich die Antikörper für die IHC-P austesten möchte. I am overexpressing human survivin delta Ex3 in a cell line. Shouldn’t this antibody (ab76424) detect this form since it corresponds to the N terminus of survivin? I have tried using the survivin DEx3 antibody (ab3731) but can’t detect it with that antibody either. I appreciate any feedback you can give me. Thank you for contacting Abcam regarding ab76424 and ab3731. I am sorry that you have been experiencing difficulties getting these antibodies to work in WB. I am following up with the lab regarding reactivity of ab76424 with Delta Ex3. Regarding ab3731, one point to note is that this antibody only works well in Western blotting on cell lysates overexpressing DEx3(see PMID 16847456), and it first requires IP with another antibody, before blotting with this antibody. It has been previously used with an IP performed from 5 million cells overexpressing DEx3. If you have not performed an IP, the antibody will not likely detect the protein in WB. I hope this information is helpful. Please do not hesitate to contact us if you have any additional questions. I am getting a band ~35 kDa. The blot is clean without any background and that is the only band I am getting. Please let me know whether this antibody has some non-specific binding around 35 kDa. I dont think the signals I am getting at 35 kDa are non-specific (Because the intensity of the bands are not same - I have loaded equal amount of protein - based on actin and BCA assay). Thank you for your email. We have not had any reports of a band being detected at approximately 35 kDa with ab3731. We do sell the blocking peptide for this antibody which should be helpful for you - it is ab13763. Interestingly, it is noted for ab469 - Rabbit polyclonal to Survivin - that in addition to the survivin band, additional bands are seen at approximately 37 and 50 kDa. However, we do not know what these bands are. Please note that we have not succeeded in detecting endogenous Survivin DEx3 using ab3731 (Survivin DEx3 is expressed at very low levels). This antibody has been used successfully however, to detect overexpressed Survivin DEx3 in whole cell extracts. This antibody only works well in Western blotting on cell lysates overexpressing DEx3, and it first requires IP with another antibody, before blotting with this antibody. It has been previously used with an IP performed from 5 million cells overexpressing DEx3. I hope this helps; if you have any additional questions, please contact us again. What size band is detected with this antibody in WB? Thank you for your enquiry. Ab3731 should detect a band of ~ 14 kDa. Please let me know if you have any additional questions or require additional assistance.